In this series, I'll be featuring some of my favorite bento blogger peeps - trying to focus on valentines/hearts/love posts, to help give y'all some inspiration with the holiday coming up! Next up: The fabulous Shannon from BentoLunch.net - most commonly associated as "What's for Lunch at Our House?" Shannon makes delicously amazing bentos for her kiddos, Ben and Faith. They recently moved from TX to Fort Carson, CO.
One of the things I love most about Shannon's bento site are "What's for Lunch Wednesdays". Every Wednesday she hosts a link-up for bento makers to show off their goods. ;) A GREAT place to share lunches and get inspired! This was one of the first linkys I ever participated in, and how I found the sites of many of my fellow bloggy buddies! 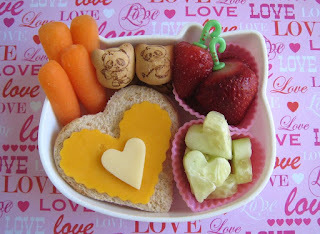 This Valentine bento she made for her son is adorable. Ben has a BBQ pork stuffed muffin, topped with some cute cheese hearts, carrots and pretzels to the left, and grapes and heart shaped cantaloupe on the right. Shannon loves cantaloupe for cutting fruit shapes, it slices really well with a metal cookie cutter, and you can just tuck the less cute parts at the bottom of the container. 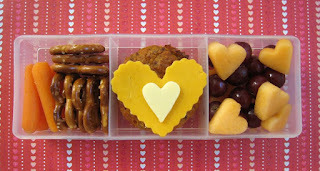 Here's a Valentine bento she made for her daughter, Faith. A simple heart shaped turkey and cheese sandwich that turned into a piece of art, topped with white and orange cheddar hearts. There's also heart shaped cucumber pieces (in a heart shaped silicone cup) and some strawberries with cute handle picks dropped in another silicone cup. Little Miss would love those panda cookies! She loves anything panda.